The smallest building blocks within the power stations of organisms which get their energy directly from the sun are basically miniature reactors surrounded by collectors which capture photons and forward them to the centre. The close correlation between structure and interaction of the components boosts productivity, a strategy which an international team of researchers is using for increasing the efficiency of solar technology. At Friedrich-Alexander-Universität Erlangen-Nürnberg (FAU), research is being carried out in this area by the Chair of Physical Chemistry I, and the latest results have been published in the prestigious journal Nature Chemistry. The group of researchers led by Prof. Dr. Dirk Guldi and his former employee Dr. Konstantin Dirian hope to revolutionise solar technology by synthesising modules based on the correlation between structure and function in photosystem II. In the newly developed systems, light-absorbing crystals such as those which are already used in LEDs, transistors and solar cells are layered into a network of hexagonal honeycombs around a water-oxidising catalyst with four ruthenium metal atoms in the centre. When shown in a rather simplified manner, the compact, stable units made up of two components with a common long axis are reminiscent of cylindrical batteries. In the self-assembling chemical process, such 'miniature power stations' create two dimensional slats. Like layers in a gateau, they form a common block which collects the energy won from the sun's rays. This is not an entirely accurate reproduction of the ideal arrangement found in the natural photosystem, but the principle is the same. Five macromolecules in the shape of a honeycomb with the ability to capture light create a sheath around each reactor core, and it has been shown that these small power stations are efficient and successful at harvesting sun energy. They have an efficiency of over 40 percent, losses are minimal. 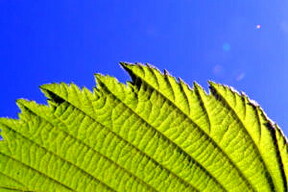 Wavelengths from the green portion of the colour spectrum, which plants reflect, can also be used. These research results nourish the hope that solar technology can one day make use of the sun's energy as efficiently as nature.